Beautiful eyes attract attention and are an incredibly useful form of natural communication. A wink or a rapid blinking of the eyelashes has been known to set countless hearts aflutter. Eye contact allows for numerous non-verbal signals that can indicate interest, desire, affection, aggression, anger and a sea of other positive and negative emotions. While many may think of ways to make their eyes ever more attractive through the use of makeup, surgical intervention or colored lenses, underlying eye health is more important than beauty. When we’re young adults, we may not think a lot about the health of our eyes beyond an annual eye exam. The aging population, however, may be far more aware of the risks of age-related deteriorating eye health. Degenerative eye disease such as age-related macular degeneration (AMD), glaucoma and cataracts all contribute to age-related vision loss. As with most age-related diseases, prevention strategies are the best way to avoid the risks of developing chronic eye conditions. The good news is that research shows a strong connection between eye health maintenance and healthy lifestyle habits, especially good nutrition, not smoking and a sustained healthy weight. To aid in maintaining healthy vision well into your golden years, it’s particularly important to feed your eyes specific nutrients through a combination of diet and supplements. A diet rich in high antioxidant colorful fruits and vegetables, especially reds, greens and blues, contains distinct nutrients that benefit the eyes as well as overall health. These nutrients are essential to eye health and may possibly improve eyesight and prevent or slow the progression of vision related conditions. Those of us with a steady diet of processed and fast foods are unlikely to obtain the daily recommended amount of vitamins and minerals necessary to maintain eye and overall health. Fortunately, along with a healthy diet, high quality supplements and nutraceuticals can assure that you are getting the full complement of nutrients. What are these nutrients and what is their role in eye health? Phytochemicals, flavonoids and polyphenols – Plant chemicals aid overall health and wellness and represent the greatest deficiency in the American diet. In order to maintain optimal health and vision, add a variety of vegetables and fruits to your daily diet to take advantage of their health promoting and disease fighting properties. Astaxanthin – There’s good reason to supplement with this powerful antioxidant. As a naturally occurring carotenoid, astaxanthin supports eye health by its ability to cross barriers in order to reach the retina. Clinical trials have shown that astaxanthin aids diabetic retinopathy and macular degeneration, helps fight eye fatigue and reduces inflammation. Omega-3 essential fatty acids – Along with other numerous health benefits, omega-3’s appear to promote healthy eyes and vision, provide protection against age-related oxidative damage and benefit dry eye syndrome by supporting healthy tissue moisture and tear production. Scientific evidence supports omega-3’s for proper visual development, retinal function and maintenance of eye tissue throughout life. Lutein and Zeaxanthin – Studies have shown these eye friendly nutrients reduce the risk of chronic eye diseases including AMD and cataracts. Lutein and zeaxanthin, which are found in large amounts in the macula and the peripheral retina of the eyes, function as antioxidants and filter out eye damaging blue light. Vitamin A – Not only essential for maintaining healthy skin and a healthy immune system, vitamin A aids in supporting retinal health and plays a role in producing the tears that moisturize the eyes. Vitamin A also helps prevent night blindness and inhibits the formation of cataracts. Vitamin C – Evidence suggests that vitamin C’s antioxidant properties may lower the risk of developing cataracts and when taken in combination with other essential nutrients, can slow the progression of AMD, cataract formation and visual acuity loss. Vitamin E – Vitamin E reduces the progression of cataract formation and in combination with vitamin C and zinc, can slow the progression of advanced AMD in individuals at high risk for the disease. As the body does not synthesize vitamin E, daily intake through diet or supplementation is important for good eye health maintenance. Zinc – Necessary to help in the absorption of antioxidants and in the transport of vitamin A, zinc is highly concentrated in the eyes, particularly the retina. Impaired vision and poor night vision are linked to zinc deficiency. As another nutrient not synthesized by the body, zinc must be obtained through dietary or supplemental sources to help slow the progression of AMD and to protect against night blindness. 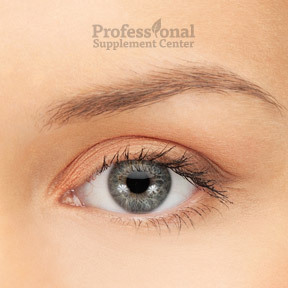 Eye & Body Complete by BioSyntrx – This high energy, broad spectrum, properly balanced, all-in-one formula is designed to support optimal eye, body and mitochondrial energy function with vitamins, minerals and antioxidant phytochemicals. VisionPro Nutrients by Pure Encapsulations – This comprehensive multivitamin/mineral formula is designed to support ocular heath, visual function, tear production, eye integrity and overall health. Non-GMO formulation. Optic-Plus by Biotics Research – This formula provides vitamins, minerals, antioxidant enzymes, key carotenoids and phytochemicals in support of healthy ocular function. Lutein-Plus (83031) by Douglas Laboratories – This product contains lutein naturally sourced from marigold flowers along with a proprietary blend of green phytonutrients and carotenoids. These ingredients support overall eye health and provide protection from free radical damage and oxidative stress. Gluten, soy and dairy free formula. This entry was posted in Home and tagged Eye & Body Complete by BioSyntrx, Lutein-Plus (83031) by Douglas Laboratories, Optic-Plus by Biotics Research, VisionPro Nutrients by Pure Encapsulations. Bookmark the permalink.